Last night, Lena Dunham, the 26-year-old filmmaker, actress, and constant cultural talking point took home two major Golden Globe awards for her work on the HBO series "Girls". 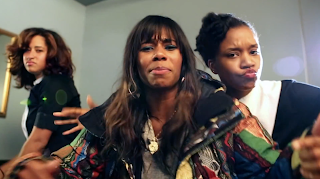 Today, Santigold has shared the video for her original song, "Girls", which appears on the show's soundtrack. The casual, triumphant clip feels like a joyous victory lap for the show and for girls everywhere: the camera jumps between women and girls across New York city as they lip-sync the lyrics, having the time of their lives. Watch below, via Brooklyn Vegan.